The day started with an excellent lecture on research – which was brought into sharper focus by being anchored to key concepts emerging in other modules that we have – especially David Blundell and Social Constructionism. Note to self – check out Burr!! There is a link to the Prezi in WebLearn – and you can access from here: http://prezi.com/ow4jnz68mt-a/research-context-for-becoming/?utm_campaign=share&utm_medium=copy. The whole class stayed together to do an intense session on ‘Drawing for teaching, learning and research’. The PPT of this workshop is in our WebLearn Module in Learning Resources. Remember to click on ‘learning resources’ to see all the sessions that have been placed there. We explored various theoretical perspectives on why and how drawing is a useful tool for thinking, exploring, reflecting, understanding and communicating. Various drawing and other art practices can also be really valuable in qualitative research. For example we were invited to consider getting research participants to make collages as ‘answers’ to questions rather then to complete questionnaires. The idea would be to disturb those commonsense answers that might automatically come to respondents – and instead explore deeper or more interesting thoughts about our questions. Arguments about the multiple values of drawing and visual practices were underscored with illustrations of how they have been embedded in and across the curriculum at Brighton University. We saw examples of Medical students set a photography project to develop their ability to really ‘see’ – to harness that in their diagnostic practices. We saw how Travel and Tourism students were sent out with cameras and asked to construct visual narratives of Brighton that told its story as a viable tourist destination. 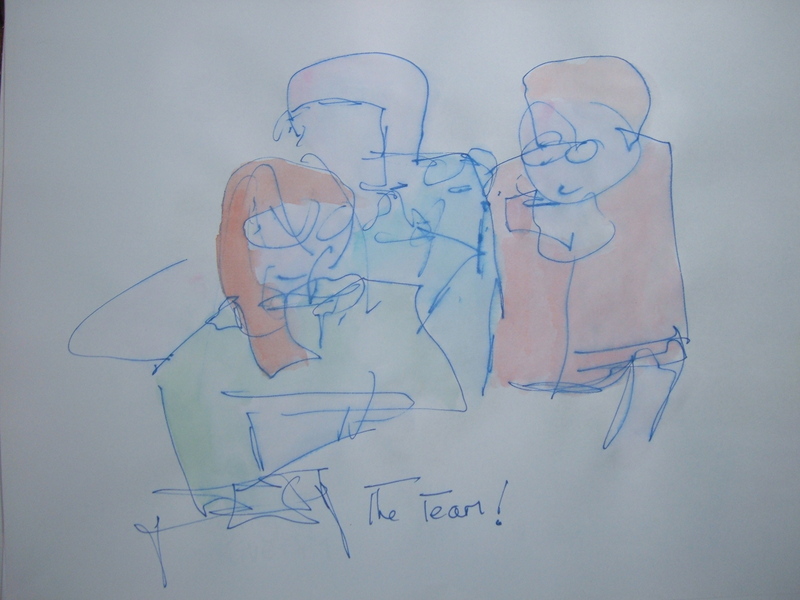 To get us drawing we were asked to ‘blind draw’ someone in the room. This was NOT drawing with our eyes closed – but drawing someone whilst looking at them – but not looking at the paper we were drawing upon. We also had to keep the pen on the paper – so there were lots of crossing lines. Of course these drawings could not be an accurate realistic representation of someone – but they could be fun and energising. And that was the point. Too many of us stop ourselves from drawing because, ‘I can’t draw!’ But drawing can be free and crazy as well as detailed and accurate. We have to play with drawing. Build our confidence to use drawing for exploration, thinking and communicating. Without this we are cutting ourselves from a very powerful thinking tool. We also discussed several drawing activities that we might like to use in the presentations and workshops that we deliver whilst still students here at LondonMet – including asking our audiences, as we were asked, to draw the key take away points from any session that we deliver. Of course all the while we are thinking about how we might build these different activities into our own future practice as educationalists. Try a quick free write on how drawing might be useful for teaching, learning and research. Structure that into a potential paragraph for your final essay. Research an artist, an art movement or an individual work of art – with a focus on how you might use it in a future teaching situation – and for a three-minute presentation W11. http://lastrefugelmu.blogspot.co.uk/2013/05/artmooc-introduction-to-art-concepts.html. In this blog we reflected on our engagement with PennState’s MOOC: Introduction to Art: Concepts and Techniques. For your Project, you might consider portrait painting; fantastic art (for Surrealism, Dadaism see http://lastrefugelmu.blogspot.co.uk/2013/06/artmooc-week-2-fantastic-art-and.html); photography and documentary photography; Mail Art; Installation Art; Arts and crafts… Choose something that excites and inspires you – use that energy! We are becoming… educationalists (see Deleuze). They decided that the captain and the remaining crew were guilty of murder – not least because the captain had a duty of care to *all* his passengers and crew… It was interesting that discussing this allowed us to explore to what extent our solutions were context-dependent, and typically influenced by our emotions as well as our values; and how far they are dependent on our over-arching moral or ethical codes, and thus are more philosophical and independent of context. The workshops diverged slightly this week – one at least went on to continue discussing the moral dilemmas in detail – and linking that to the way we need to use argument and evidence in our academic writing. The others seems to have spent some time looking at active notemaking – and how that also prepares us to engage with ideas: to have a dialogue with the theories, concepts and case studies that we study – and come to our own conclusions… See: http://learning.londonmet.ac.uk/epacks/studyhub/note.html Much was made of just how active we have to be to make our ideas memorable. The workshops all covered Academic writing in a more formal way than in our first introductory Writing Workshop – that introduced us to free writing – and to Winnicott (1971)!! To what extent is the response to the moral dilemma a question of values? To what extent does it rely on analytical and critical thinking? We did think that essays were about finding our own voice – but obviously there is the dark side of academic writing! We write and it is measured, assessed and judged. Philosophically we may accept that any system that offers certification will measure and stamp progress… But awareness of being judged can inhibit our thinking and engagement. We also thought of different ways to assess – by presentation and by the production of digital artefacts that ‘reflect’ on a part of a course. In #edcmooc (E-learning and Digital Cultures), assessment includes the production of a digital artefact PLUS the peer review of three other artefacts. W7: Becoming an Educationalist: What is a Conference? This was our Enhancement Week and we explored Universities as places of research and knowledge-construction and dissemination. 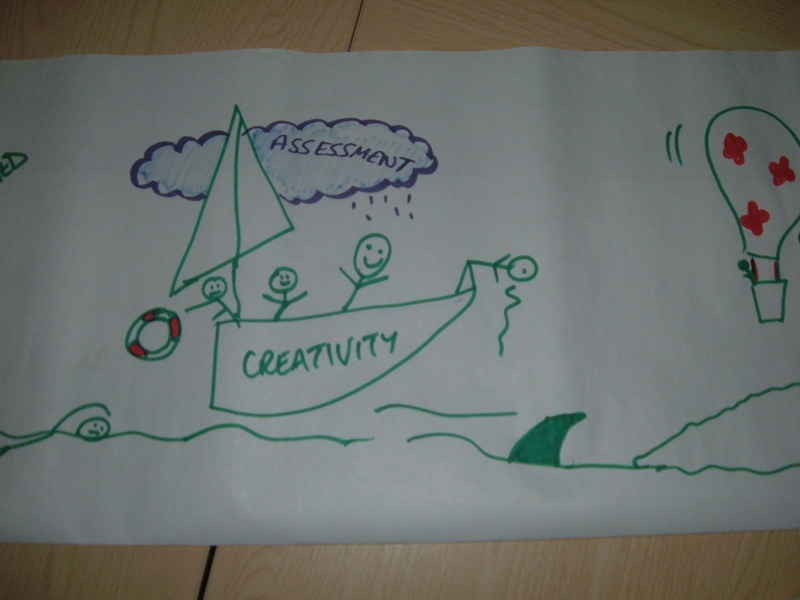 First we were asked to draw our concept of research – and to use the drawing to seed our notemaking for the session. Sandra’s and Quaco’s notes were displayed to the class and we could see the slightly different interpretations of research through the similarities and differences in their drawings. Sandra’s had an eye scoping out the ground – then bubbles for thinking and light bulbs for ideas. Another eye signified the research process itself – then more thought bubbles to indicate interpreting data. Finally there was a mouth indicating that we need to tell people about the findings of our research. Quaco’s drawing included pictures of houses, rooting research in real life – and real communities and with real life outcomes. All the ideas gathered from the research in Quaco’s drawing ended up in an essay. This shows that our own studies are also research – and that we tell people about our findings in our assignments. There were plenty of ideas to note – and to follow up later. Academic Partners Programme Birmingham City University. Student Academic Partners. Student Academic Partners: The Scheme; The Pioneers; The Projects. “Applications are being invited for the latest HEA Change programme, Students as partners in the curriculum. This programme will help HE providers develop their capacity to work with students to enhance the curriculum and engage students with learning and teaching processes and will build on the successes of last year’s inaugural Students as partners change programme. At least half the members of participating teams will be students, with the rest made up of academic staff, professional support staff and senior managers. Last year’s programme included teams from ManchesterMetropolitanUniversity, University of Oxford and University of Ulster with projects such as reducing distress and improving achievement amongst students, students at the heart of curriculum design, and students as partners in a transformed university. Further details about last year’s programme, and the mini case studies, are available here on the HEA website. Due on 3rd December. It will be a one day for 50 people with just one strand to attend. “Learning Developers are invited to our one-day conference, hosted at LondonMetropolitanUniversity to explore how Visual learning practices are becoming mainstream in the digital age. Drawing upon experiences of ‘Draw to Learn’ (from the LearnHigher CETL); MOOC participation; and recent classroom practice – we explore the embedding of a series of Visual tasks in classrooms across the disciplines. This day will inform, challenge and offer you practical ways to transform practice. 2.45- 3.45 MOOC madness: digital tools, activities, exemplars – and table tasks. We were asked to think about our notes and how they had changed over the course of the lecture. Our notes are supposed to be a dialogue with the information that we had heard. They are supposed to be active and interactive… With things to do. Our Peer Mentors had been invited to our seminars to act as audience for the Poster Presentations we were giving on our field research – where we had explored the University as a site/many sites of learning. This gave us a taste of the Conference experience – we had undertaken some research and we were presenting our findings to our peers. There were great presentations from everybody – not just with posters, but using Prezi as a poster form – and with some creative use of PowerPoint and embedded video interviews (conducted as part of the initial research process). Hopefully participants will post links to their blogs – and their presentations – in their own blogs. There were definitely a few ideas emerging that could be worked up in to an HEA Bid! Our final task was to think about the possible shape and size of the next Get Ahead Conference at London Met. Get Ahead is designed to be a Conference for students organized, and in some case delivered, by other students. In the past, Events Management students seem to have taken the lead with this Conference – and typically final year students at that. This year we have been asked to come up with some ideas – and to seriously consider taking on the planning, advertising and delivery of the actual event. Of course it will be hard work – it will require real time and effort – and if we take it on we must mean it and deliver. The typical Get Ahead has a focus on student success: success in their studies – and success in finding employment. Previous years have had strands on Study and Academic Skills: Managing time; Developing memory; Drawing for Learning; Making great notes. There have been strands on Academic writing – with some workshops delivered by Writing Mentors – and sessions on Dissertations delivered by staff. Student Services have run sessions on CV production and preparing for Job Interviews – and also sessions on developing self confidence. We were invited to shape a new Get Ahead – and to think about the practicalities of budget – and of how we night actually get time-poor students to attend. Watch this space to see if after a week’s further thinking about it – there does emerge a group that offers to run Get Ahead with and for the Centre for the Enhancement of Learning and Teaching. If we do it – we will blog about it! What is learning? How do we learn best? what METAPHOR would you use to describe the learning process? Why We Need Digital Vikings #edcmooc. via Why We Need Digital Vikings #edcmooc. W6: Writing is easy – you just stare at a blank piece of paper till your eyeballs bleed! Peer mentors – and getting Poster Presentations ready. We started the interactive workshop with a question: What are your hopes and fears about University level writing? And there seemed to be a general disquiet about the thought of finally committing words to paper – for assessment. So this gentle unease launched us into an activity designed to get us all experiencing the hopes and fears and pain – and pleasure (?) – of University writing. When asked, we turned to our ‘Writing’ page to write for ten minutes without pause on the extremely difficult and challenging question we were then presented with! If we did stop writing for any reason, we had to write that reason, no matter how trivial or insignificant on the ‘Commentary’ sheet. Winnicott (1971) argued that play is necessary to counteract the implicit threat that occurs when we are in transitional spaces – between worlds, between classes, in alien educational settings. Discuss in relation either to becoming a successful student or becoming a successful teacher. Reflection (1) What was your reaction to that writing? Most of us were slightly horrified by the question. There was fear and anger – and perhaps even despair in the room! Obviously it became clear that we were not supposed to stay in that fearful state. We were urged to try and realise that the biggest writing block that most people have is their own lack of belief in themselves. (This refers back to Bandura and the self-efficacy point raised some weeks ago.) Whilst some tutors and many students worry about ‘problems’ like spelling, punctuation and grammar – the biggest problem for most people is just starting to write. Just to write anything. Just to get words down. Just. To. Get. Anything. Down. On. Paper. Once we have some words down, we can change them. Till then – we stare at that blank piece of paper till our eyeballs bleed. We also discussed the question itself. It was noted that the question was describing our activity. We are in the transitional state of becoming educationalists, of becoming academics – and of becoming academic writers. This activity was asking us to play with writing as a way of tackling our fear of writing… and our fear of being in this transitional space. Education sadly instead of encouraging us to learn by trial and error – punishes mistakes. So, we fear failure; we fear that we will pay a bigger price for ‘failure’ than others; we fear changing; we fear being judged; we fear losing contact with our friends and families… We feared not knowing who Winnicott was. We feared that this looked like a statement and not a question! Was this a trick? A couple of reassurances followed. Assignments are often called questions – no matter how they are written. We did not have to know that Winnicott was a psychologist who argued that it is only when we play that we are wholly, fiercely truly alive and ourselves (tutor); because we could leave the lecture theatre and look that up. We were encouraged to change. To let go of our instinctive fear of failure and give ourselves to the activity… and to keep trying that. Reflection (2) Why did you stop writing? Accept the task – or fake it! Leave gaps – read more after writing. Here there was much emphasis again placed on writing and writing and writing – and not stopping to re-read and revise and improve. We need to write till we drain all our ideas and thoughts and random mental flashes on to the paper. This sort of writing is described as free writing – and as a ‘brain dump’ and can be a really good way of just getting ideas out and on the page – for study and development. Another more formal free writing and that was mentioned in the seminars was to use the Paragraph Questions to help shape our ideas – to draw our thinking out. Remembering when doing so to write BLAH BLAH or NEED AN IDEA HERE or NEED ANOTHER REFERENCE… So that again the writing flows – and the assignment can be developed later. So what – who cares? Make a point. Take the paragraph back to the Question. The big tip of the day was to write these out on to an index card and stick that to the front of your PC. Reflection (3) What do you like about your own academic writing practices? I am still not sure if my work is considered academic, I still don’t know what makes one of my essays better than another. I have been humiliated in ways that I would never have put up with anywhere else! Academic language, the kind of language that doesn’t readily flow off my tongue: the type of language I rarely use when speaking to my peers. The type of language that I don’t readily understand and the type of language that means spending hours at a computer turning something quite simple into something that sounds moderately impressive with elitist results. We discussed the reasons behind the different statements – and how hard it can be to hear formative feedback in the positive light in which it may be offered. Typically when tutors feedback to us, the intention is that we improve… If you fail to score a goal you do not leave the pitch and never play football again – you can shrug and carry on. We need to learn some of these normal survival tactics in our studies. Treat writing more like a sport or driving or cooking… We will get better if we practise. See writing as a process not just a product. Develop the craft of writing – rather than expect to pour out perfect essays first go. Make ‘safe’ spaces to write – at home – and with friends. Write for half an hour every day! Written Kitten – new kitten every 100 words! We took on the notion of becoming writers – and becoming successful students. This week we also explored successful presentation strategies (http://learning.londonmet.ac.uk/epacks/studyhub/presentations.html) and how to harness positive thinking in the academic environment (http://learning.londonmet.ac.uk/epacks/studyhub/positive.html) – all to facilitate the design and delivery of our Poster Presentations (on our field research) – for next week… and this continued with our Peer Mentors in the fourth hour. This week the Becoming blog is coming to you courtesy of Mo Abdullahi – one of Quaco’s seminar group students. Mo got out and about the University – he observed – he took great pictures – he made observations… and already we can see some possible avenues for further research. Support Mo: read his blog; be inspired; give him some feedback; share your blog posts by adding them in the Comments box on Becoming. Whilst reading the module handbook, I discover that it’s study week. I can’t deny that I’m relieved. I’ll be at work the night before Wednesday’s lecture, so it looks like a nice lie in is on the cards. I continue to scan the handbook and the next line jumps out the page. It says “In pairs..” Great another group task. Having missed a fair portion of the lectures and seminars due to my employment commitments, I find that I do not know any of my fellow students to pair with. Looks like I’ll be doing this alone. Feelings of annoyance and regret start to grow in me. I do my best to repress these emotions because I will end up procrastinating and make excuses not to do it.